How Much Turbulence Can Fed Handle? The central bank's reputation has been a brake on upheaval. That may not last. Federal Reserve building in Washington. In the second half of last year an unprecedented event took place that economists and market analysts didn’t seem to notice. Oil prices were halved in a matter of six months, with the benchmark barrel of Brent crude going down from $115 to $58. There had been a steeper price drop in the oil market the second half of 2008, but, first, it took place in an environment of a global financial collapse and, second, it followed a speculative run over the previous year and a half — during which oil prices nearly quadrupled, from less than $40 to $147. What we saw last year was a sudden, inexplicable slide that followed years of remarkable stability, when oil averaged over $100 in 2011–13. Plus, it happened while the world economy continued to grow. That price collapse should have put investors on high alert. Clearly it wasn’t as if oil production suddenly spiked or demand evaporated. Rather, it was the first warning sign that asset price bubbles that had been inflating since 2009 thanks to zero percent interest rates supplemented with quantitative easing were starting to pop even without any rate hikes by the Fed and while no other major central bank in the world was even thinking of raising its rates. Since oil prices plunged last year — and then, after mid-2015, dropped further, revisiting their post-Lehman Brothers lows — there has been a typical pattern of asset price deflation. Some bubbles followed suit, such as emerging market bonds and currencies. The few bubbles that have popped so far have already caused considerable financial losses. For example, lower oil prices have reduced the revenues of crude producers worldwide by $4.8 billion a day. While they also bring savings to oil users, the $6 trillion-plus lost in the Chinese stock market since the bubble started to deflate there and the trillions lost worldwide during the August declines are a net negative. Yet investors, despite living through two meltdowns over the past decade, refuse to throw in the towel. Other bubbles have already inflated since the oil price decline — and have even already popped, such as the Chinese stock market. Others are still going — for instance, 10-year German government bonds, which saw their yield plunge from nearly 3.5% in mid-2011 to zero earlier this year. The NASDAQ Composite index rose some 1,000 points, or more than a quarter of its value, in the year to July 2015, breaking its previous all-time high. Investors clearly still have faith in the two institutions that bailed the world economy and financial markets in 2008 — namely, the U.S. Federal Reserve and the government in Beijing. This is especially worrisome, because we’re not talking about financial bubbles but reputational ones. If they pop, their deflation could prove far more damaging. Of the two, the reputation of the Chinese government looks far more precarious. For two decades, it seemed to do nothing wrong. China was growing at double-digit rates, deftly sidestepping financial crises that rocked the regional and global economies. But now, once the situation changed and the old development model stopped working, the bureaucrats in Beijing are suddenly at a loss. The government is reverting to its old repressive ways, reminding everyone that it is a Communist regime that used to starve and imprison people and stifle the entrepreneurial spirit during the Mao Zedong years. China is at a crossroads. For many years, the government has been artificially keeping the economy out of recessions at all costs. Yet, periodic recessions have a salubrious effect on the economy, wiping the slate clean and getting rid of excesses. The danger is that by avoiding smaller corrections, China has set itself up for a huge one. Meanwhile, its economy has grown to be the second largest in the world, which means its economic and financial problems will surely reverberate around the globe. The likelihood that the Fed’s reputational bubble will deflate is smaller, but the stakes if this does happen are much higher. For the past two decades, the Fed has been spurring Wall Street to new heights with the so-called “Greenspan put,” named after the longtime Fed chairman Alan Greenspan. There has been an implicit understanding that the Fed will ride to the market’s rescue with easier monetary policy if things start going badly wrong. This has created a sense of complacency among investors that was recently on full display. Market declines — even scary ones like the ones in late August — are seen as buying opportunities. The Greenspan put has worked so far. Market troughs have been short-lived, and buying after some carnage has brought exceptional rewards time and time again. This is why, more than in previous market downturns, investors seem to be piling into stocks. In the first half of the 1990s, when the Greenspan put went into effect, the average 10-year Treasury yield stood around 7%. Over the past two years it averaged around 2.2%. Since the Fed has a medium-term target for inflation at 2%, this means that bond investors already expect to make no money going forward, and so there is little room to push bond yields lower. Plus, in the 1990s, the Fed funds rate was over 5%, compared to zero currently. Once again, the room for further easing is nonexistent. In other words, the Fed has no ammunition to counteract any economic crisis or financial meltdown. Recent talk has centered on the Fed “overstaying” monetary ease and running into an uptick in inflation, but the larger problem is what would happen if the stock market suddenly dropped. The central bank can’t lower interest rates sharply the way it did in the late 1980s, the early 2000s and, most dramatically, in 2008. Even if the Fed were to raise rates now, it would have to do it cautiously, which could convince stock investors that the Greenspan put is still in effect and inflate the stock bubble further. It’s a curious situation in which the Fed may be racing to tighten in order to have room to ease when stocks plunge in response to its tightening. Pumping liquidity into the financial system will also be of limited validity. After several rounds of quantitative easing, during which time the Fed has increased its balance sheet by over $3.5 trillion, the effectiveness of printing even more money will be questionable. 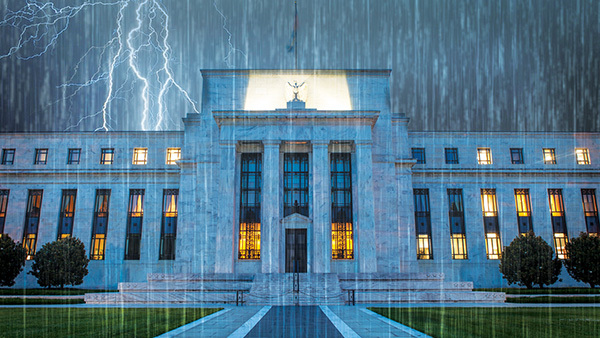 The Fed has so far avoided the reputational backlash that the U.S. government overall has suffered in recent decades. But the risk is that it will be revealed as impotent in the face of a major market decline. After all, Fed officials are no more than a bunch of bureaucrats, not necessarily more competent than the Chinese Communists. But surely the real economy is still strong? The recovery that commenced in 2009 not only has entered its seventh year but seems to be picking up steam as it goes. Inflation has been subdued; based on the GDP deflator, prices have increased by less than 10% over the past six years. The labor market is righting itself. Businesses are investing and hiring and even wages, for once, are rising. Besides, consumers have benefited from lower energy prices and will pay less for gas, heating and air conditioning, leaving them with more cash to spend on other goods and services. The same is true of the rising U.S. dollar, which makes U.S. imports cheaper. The emerging picture, then is of strong economic fundamentals that should spur growth in US corporate profits. This Goldilocks economic growth — not too hot and not too cold — even encouraged analysts to predict a return of the bull market in the final quarter of the year after the late summer pullback. In reality, profits are the other weak link of the current stock market. Remarkable growth in corporate profits (not just in dollar terms but as a percentage of GDP) is another major factor, along with easy monetary policy, that has underpinned the long-term rally in the stock market. With the exception of the recessionary 2008–09, corporate profits measured around 10% of GDP over the past decade. That’s the highest level in the post-World War II era and about half again the postwar average. Before the subprime mortgage crisis, 2013 Nobel laureate Robert Shiller argued that house prices should not outpace the cost of construction over the long run and that their rapid rise will have to be reversed at some point to return to trend. A similar logic applies to profits growth. We know from the beginners’ microeconomics class that profits in a completely free market are limited and that even monopolists do not have arbitrary pricing power. While profits grew relative to the size of the economy, wages and salaries were losing ground. Over the past decade, wages measured less than 44% of GDP, compared to an average of around 48% during the postwar period. At the same time, government revenues since 2005 have constituted the lowest share of the economy of any 10-year period since the 1930s. Government spending has been curtailed by the 2013 budgetary sequester and other cuts, but a longer-term trend of the declining overall tax take means the government had to add to its debt burden. Runaway growth in China and in other emerging economies, coupled with a weak U.S. dollar for much of that period, meant that U.S. multinationals could boost their profits in terms of U.S GDP. But now China’s economy is slowing, and economies dependent on China, such as Brazil, Chile and Argentina, are sliding into recession. The dollar, meanwhile, has spiked. From now on, U.S. companies will have to depend on the domestic market to earn profits — which may prove difficult unless wages and taxes increase relative to profits. It’s a classic Catch-22 situation. In fact, the Cyclically Adjusted P/E ratio — developed, incidentally, by Robert Shiller — lately has stood at around 25. This should get investors’ alarm bells ringing loudly. The only time it has been higher was in the run-up to Black Tuesday in 1929 and just before the dot-com meltdown in 2000. And the last time it was approaching its current level was in 2007. It is not just that the stock market may be set for a fall, but that it may drag the Fed’s reputation down with it.